Vending machines aren't typically known for dispensing healthy food. Doritos, Kit-Kats and bottles of sugary soft drinks? Yes. But royal quinoa sesame noodles, marinated kale salad and a juice made with lemon, ginger, raw honey, echinacea extract, infusion of edlerberry and elderflower? Not likely. 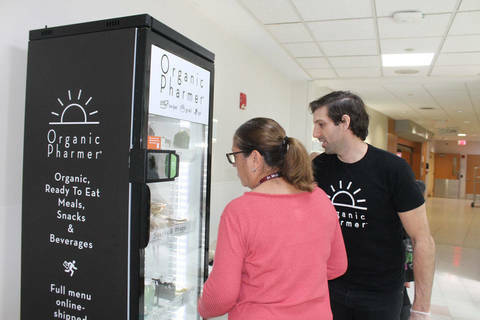 At Saint Michael's Medical Center, however, a new vending machine was installed next to its cafe that dispenses healthy, organic, vegan food, drinks and snacks free of commonly known allergens: gluten, corn, soy, dairy and egg. Organic Pharmer started as a storefront in Rye Brook, N.Y. and now has expanded into vending machines that can go pretty much anywhere. Saint Michael's is its first location. The company plans to roll out vending machines at other locations in the coming year, espeically in hospitals. “I really wanted to get into a hospital because I know the food isn’t always the healthiest,” Petronaci said. At Saint Michael's, the vending machine had an advocate in Tracy Hubbell, the regional assistant general counsel for the Northeast for Prime Healthcare, which owns Saint Michael's. Hubbell, a vegan, works out of Saint Michaels and was looking for a healthier alternative. “We try to get our price point as low as we possibly can, but products we use in our food are going to be a little more expensive,” Petronaci said. "At the end of the day, you have to make a decision: Do I want to spend a little bit extra now to provide myself nourishing food, so I don’t have to pay later in health care costs? It’s a preventative health decision”.